It was widely reported at the time of her death that Carrie Fisher had once penned her own obituary that read, 'drowned in moonlight, strangled by my own bra.' And it's quite apparent that she had a sense of humor about her own demise. 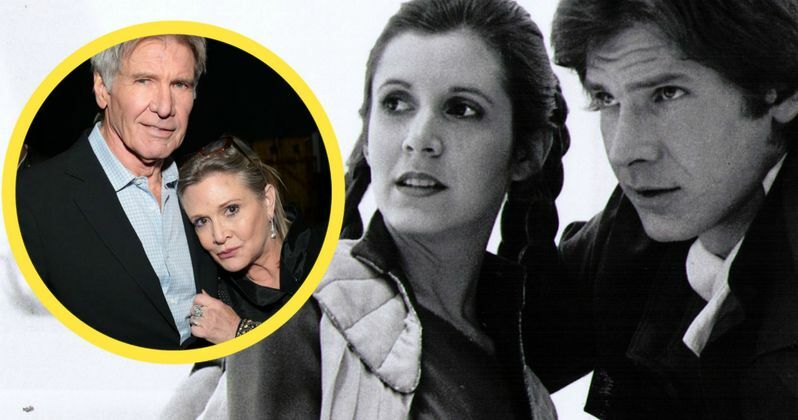 After having passed away this past December during the holidays, it has been unearthed that the late Star Wars actress actually had a favor to ask of her former co-star and love interest Harrison Ford. She wanted him to sing during her Oscars in Memoriam tribute. The Oscars will air live on ABC this February, and the In Memoriam segment is going to a lengthy one as some truly great artists were taken from us in 2016. And as news spreads about Carrie Fisher's request for Harrison Ford to sing, it's quite likely he'll do just that. The pair were close, and late last year, before she died, Carrie Fisher even finally admitted the two had an affair on the set of the original Star Wars. Harrison Ford sometimes comes off as a cranky old man, but as any appearance on Jimmy Kimmel will tell you, he also has a sense of humor. And with Kimmel actually hosting the Oscars this year, we're sure something quite amazing is being planned. Related: How Crazy Will the New Force Powers Get in The Rise of Skywalker? Carrie Fisher's request for Harrison Ford to sing during her Oscar In Memoriam segment was unearthed in an April 2010 interview with Rebel Force Radio. Fisher appeared on the show to talk all things Star Wars with hosts Jimmy McInerney and Jason Swank. Asked if she'd seen Ford lately, the actress and author responded with this. "I asked him [at a party] if he would be in my death reel, and if he would sing. It's just something I want. So, I figured they'll bring out, depending on when it happens, there's a lot of people they can bring out. He's going to sing 'Melancholy Wookiee'." Carrie Fisher went onto say she was inspired by the Oscar tribute for late writer-director John Hughes, which featured a line-up of all the actors that appeared in his movies. Later on in the interview, Fisher was asked if Ford can even sing, as he's never made any public display of being able to do so. Her response was quick and very funny. "No, and I don't think we're missing much." Jimmy McInerney was recently interviewed by ABC about the unearthed interview, and he admits he was a little overly shy during the chat. But insists that the actress wasn't entirely joking about this request. And is now sharing the audio to show Harrison Ford and the world that this is actually something she wanted. He goes onto say this. "That's what she's asking for. You can say she's being flippant and silly, but that's what she said she wants. We're looking to create a movement here." At this time, The Academy has no plans for a special tribute to Carrie Fisher that stands apart from the annual In Memoriam. But a spokesperson from the Academy explained to ABC News the she will 'most likely' be featured in the In Memoriam segment. Sometimes, certain celebrities are left out for various reasons, with the Academy siting date of death as a main reason for exclusion. But it's highly doubtful someone who has been as mourned and remembered as Carrie Fisher and her late mother Debbie Reynolds will be left out of this part of the live telecast. Now, we'll just have to wait and see if Harrison Ford shows up to sing about his late co-star.